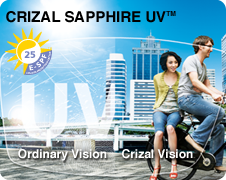 Crizal Sapphire UV™ - the clearest No-Glare lenses ever created now with the most complete daily UV protection. Crizal Sapphire UV lenses are nearly invisible on the wearer. It gives you all the benefits of Crizal Avancé UV™, plus the best clarity of vision to meet the visual demands that digital devices place on patients' eyes. Superior No-Glare Performance - The key innovation of this product is enabled by the Enhanced Light Transmission™ (ELT) System - a technology which maximizes light transmission through the lens by even further reducing glare and visible reflections. As a result, Crizal Sapphire UV has 50% less reflection than the previous industry leader - Crizal Avancé UV. Best Scratch Resistance - Crizal Sapphire UV feature "glass-class" scratch resistance thanks to the SR Booster™ layer. This technology raises the scratch resistance to a level unmatched by any competitor. Unmatched Cleanability - Crizal Sapphire UV utilizes Essilor's proprietary High Surface Density™ (HSD) process to achieve the industry's best Cleanability with a contact angle of 116º. 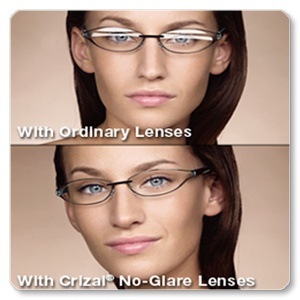 For patients seeking the most advanced No-Glare lens on the market, ask us about Crizal Sapphire lenses.